You can collect up to an additional 12,500 Clubcard points each and every year when you recycle old ink cartridges. That’s worth up to a whopping £500 when you use it with Tesco Clubcard Partners! You can collect up to 125 Clubcard points per cartridge, depending on the ink cartridge you recycle. You can send in a maximum of 100 inkjet cartridges per year, per household. For this offer, any year runs from January through to December. The list of cartridge accepted is quite big – see them all below. How do you send in the cartridges? After you’ve found your cartridge listed, simply print off the free postage label and attach it to the package you’re sending. You need to fill in your details on one half of the slip, adding your Clubcard number. You also need to tick that you want to collect the loyalty points (or donate them to charity). If you don’t tick any of the boxes, they will donate the money to charity as default. The maximum weigh of cartridges you send cannot be more than 1kg. 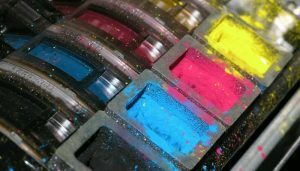 If you’re sending a lot of ink cartridges in to be recycled then you will need to split the package out and send more than one. They are clear in their terms that this is a consumer only scheme. Cartridges need to be for personal use. If you’d prefer, you don’t have to take the points yourself. You can choose to donate 50% to charity and keep 50% of the points. Or, you can donate the whole (up to) £1.25 to charity instead. This year, the charity being supported by Tesco is Diabetes UK and the British Heart Foundation. What cartridges can you recycle? There are a fair few cartridges listed that can can swap for extra points! If you want to send in a laser cartridge or inkjet cartridge and it isn’t listed you can, but you won’t be able to collect any Clubcard points. One other thing to be aware of is that if the ink cartridge is damaged, you won’t be able to collect points but they still recycle them. Looking for more ways to boost your points? Find out how to collect more points with Tesco Clubcard.